Apple has released iOS 10.0.3 for iPhone 7 and iPhone 7 Plus users. The small update, which arrives as build 14A551, includes a bug fix to resolve potential cellular connectivity issues. The brief release notes included with the iOS 10.0.3 update states the release “fixes bugs including an issue where some users could temporarily lose cellular connectivity.” This appears aimed at addressing some reported difficulties with particular cellular networks, ranging from dropped calls to an inability to maintain an LTE connection. If you have experienced any such issues with an iPhone 7 or iPhone 7 Plus, updating to iOS 10.0.3 should help. 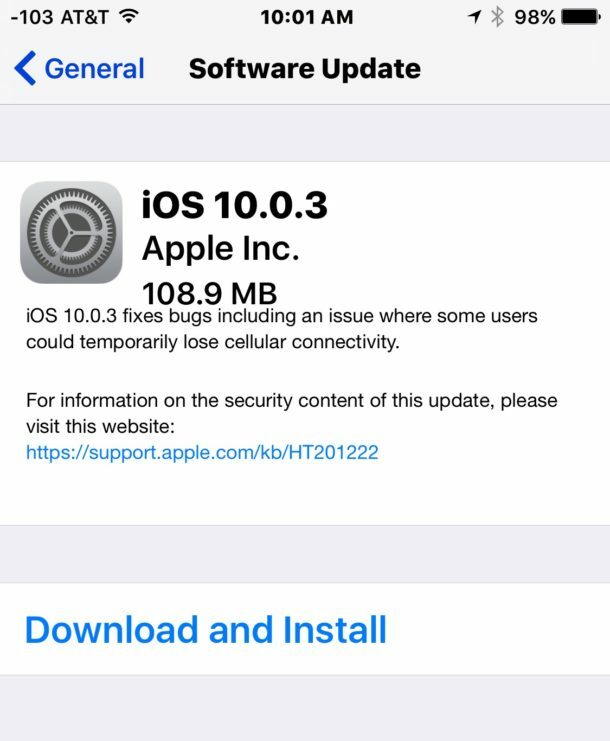 iPhone 7 and iPhone 7 Plus owners can download the latest iOS 10.0.3 bug fix update now from the Software Update mechanism within Settings app, or through iTunes. As always, backup your iPhone before updating system software. Backing up to iCloud or iTunes, or both, is strongly recommended. 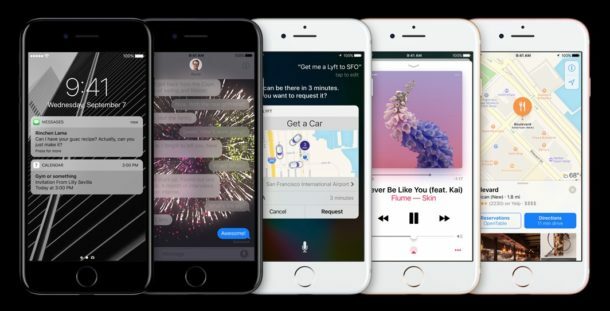 While iOS 10.0.3 is only available for iPhone 7 and iPhone 7 Plus devices, a broader software update versioned as iOS 10.1 will likely be released in the coming weeks. Currently in beta development stages, the iOS 10.1 update includes the Portrait mode feature for iPhone 7 Plus users, alongside some minor feature adjustments and a variety of other bug fixes to iOS 10 as well. I will install the update and I hope it fixes the mobile issues. My iPhone 7 Plus has dropped calls a handful of times or has cut out more than usual, sometimes the microphone sounds bad but only the other side of the call can detect that, it’s impossible for the user to know. Also the cell signal and wi-fi signal seems weaker than the iPhone 6s it replaced. Looking forward to a software fix, since the hardware is the same it must be a software solution. This update caused my iPhone 7 to explode and burn up. I could not update and got the issues. Asking to connect with iTune and then getting unknown error (52). Do you guys have the same issue? Updated iPhone 7 plus to 10.0.3 a couple hours ago and just noticed the phone was very hot under the camera near the power button. I power cycled and it seems to be cooler now. I have the iPhone 7 plus and is updated to the iOS 10.0.3 but I don’t have portrait mode. How do I access it? Or activate it? My tomtom, googlemaps don’t work sine i updated. ?